Five years ago in a borrowed boardroom, the owners of this firm explained to us their intention of disrupting the commercial lighting industry with a combination of technology, performance and design not seen previously. They asked for our help to position and brand them. After the initial splash of their launch and the brand’s ongoing success, the challenge became one of continual innovation and the expectation to do so. 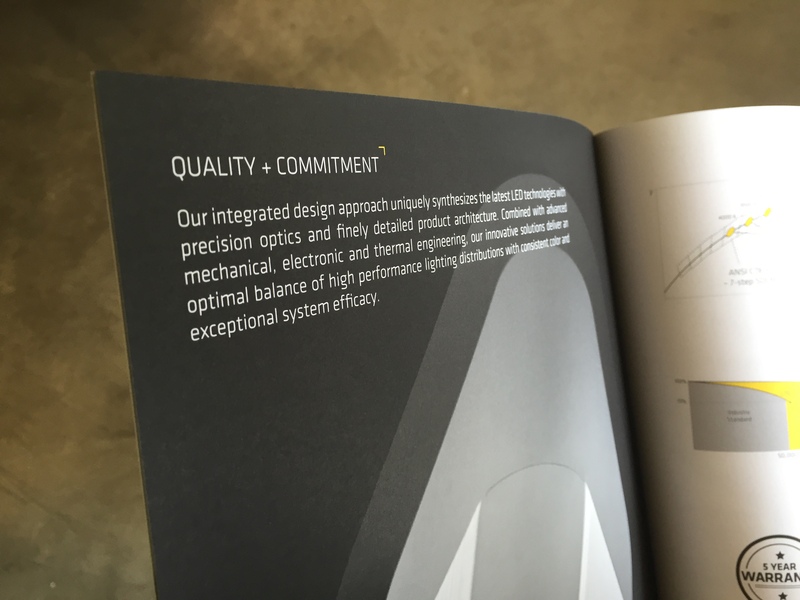 The pending introduction of several new products triggered the need to develop a new catalogue/brochure. 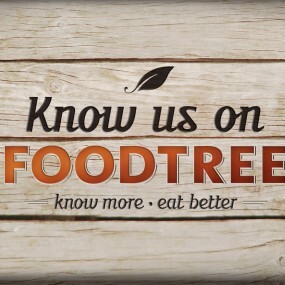 The requirement was it had to be as compelling as the one we had originally designed to launched the company with. We did not want to deviate entirely from what worked so well in the first edition, but had to look at scaling up from 60 pages to 180 pages, without losing the touches that created impact. Additionally, we are appealing directly to the requirements (and inspirations) of architects and designers, so despite the need to economize production, the approach had to remain design-centric. 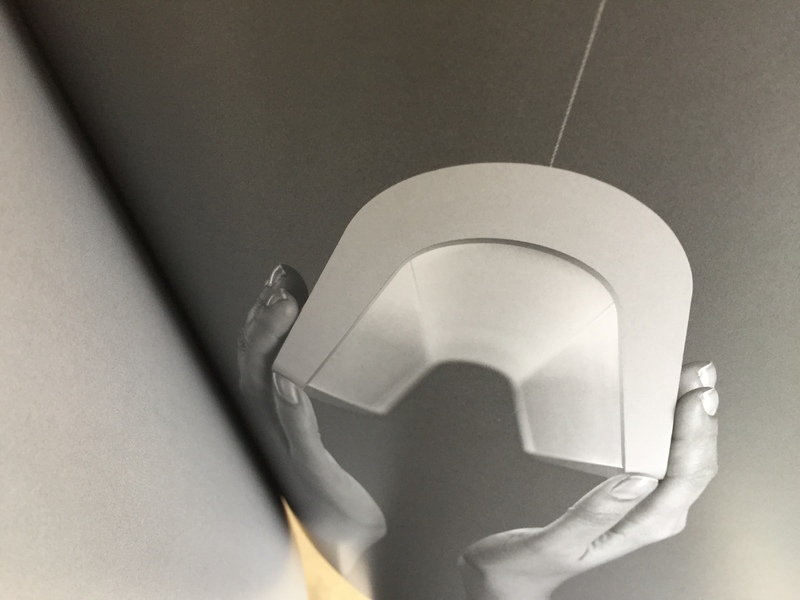 To address the additional products while still retaining good flow throughout the piece, we decided to physically separate all of the technical information and specifications into their own section, and devised a folded flap from the back cover to distinctly ‘package’ this section. This freed up the front of the piece for storytelling, and for presenting the product in the more appealing way—big images and installation photography. 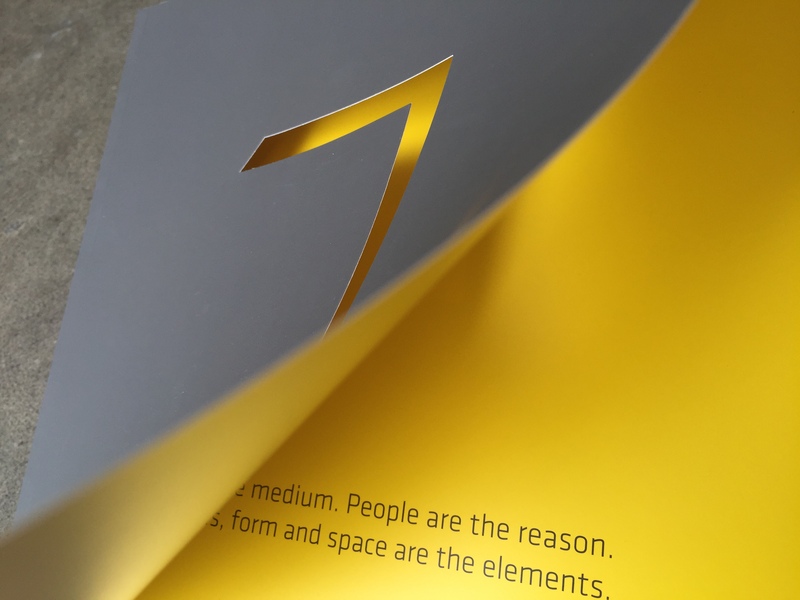 The original iteration of the brochure featured a laser cut logo on the cover. Due to technical and time constraints, we found this feature wasn’t possible on this new edition of the catalogue. 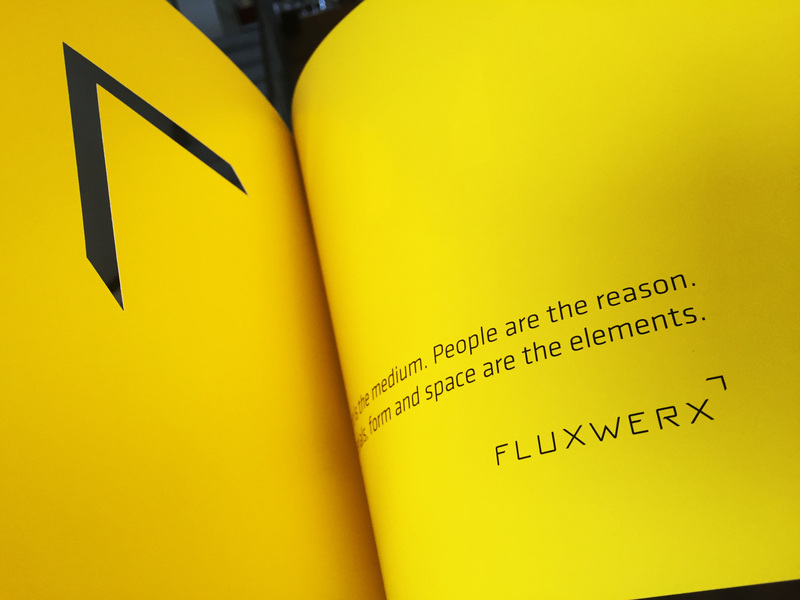 Yet, Fluxwerx had a reputation for being different than other lighting companies. 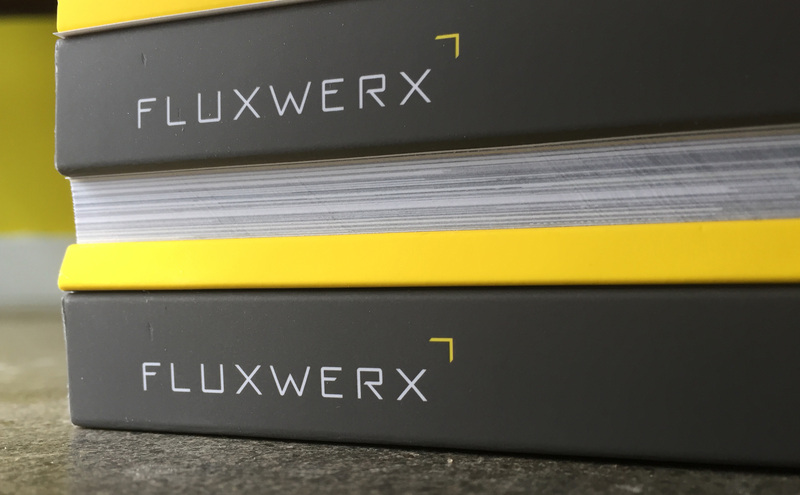 With the brand firmly established through the use of the grey and yellow corporate colours and logo, we decided to feature only the ‘notch’ logomark on the cover. It was a bold move, one we thought would garner attention without leaving our audience guessing. 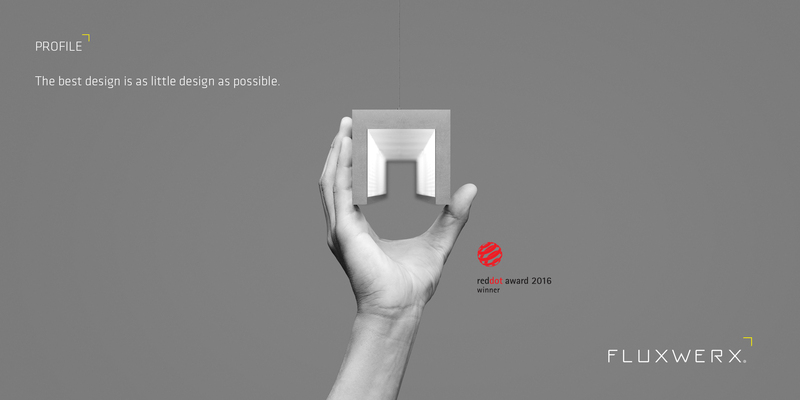 During this same period, Fluxwerx received a coveted Red Dot Product Design Award— evidence of their design forward approach that also runs through everything they do, including branding. With clients like Nike, Google, Microsoft and Apple amongst others, there’s no question that the company has hit every goal they set forth. In fact, back in that boardroom a few short years ago, much of what has happened was part of the initial vision. 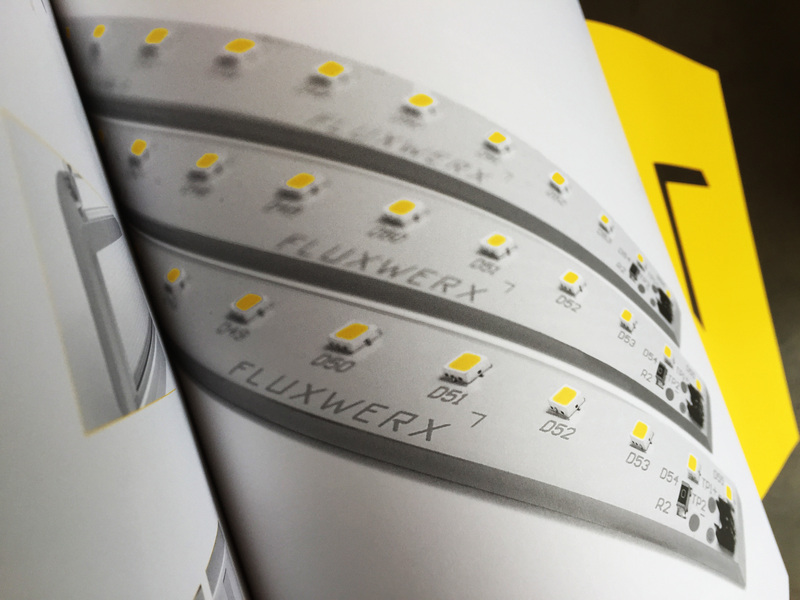 This includes, most significantly, the recent sale of Fluxwerx Illumination for over $60 million to the Lumenpulse Group. 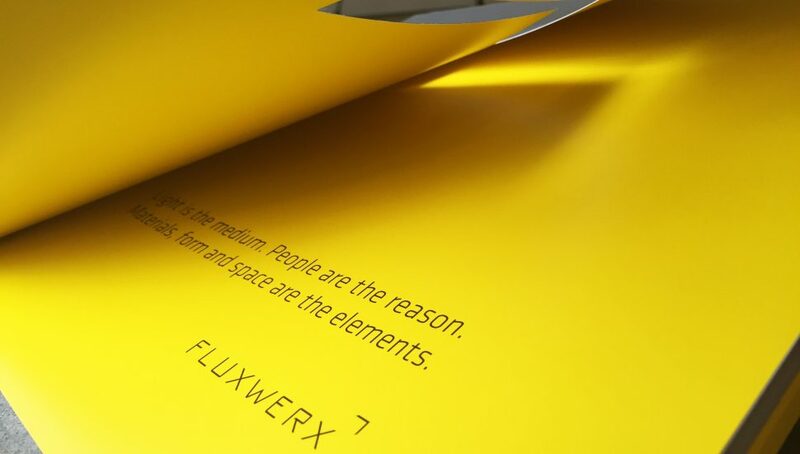 As Fluxwerx continues to innovate and be recognized for design and performance in their industry, they will always have a need for intelligent, strategic design to prove it.